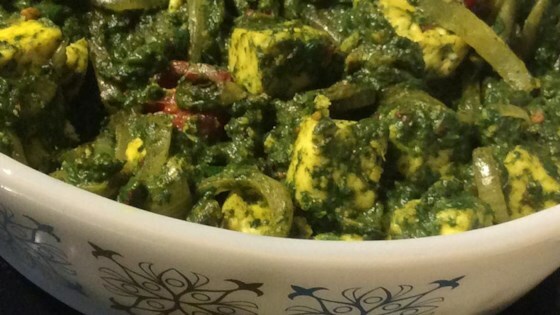 "Saag paneer is a classic Indian dish of cooked spinach studded with cubes of fried paneer cheese. Thickened with cream or coconut milk, it's a hearty and filling vegetarian meal." Bring a large saucepan of water to a boil. Cook spinach and fenugreek in the boiling water until wilted, about 3 minutes. Drain well and transfer to a food processor. Puree until finely chopped, about 5 pulses. Heat 1 tablespoon canola oil in a large skillet over medium heat. Fry paneer cubes, stirring constantly, until browned on all sides, about 5 minutes. Set aside. Heat 2 tablespoons canola oil in the skillet and fry the cumin seeds until lightly toasted and aromatic, about 3 minutes. Add onion; cook and stir until onion begins to soften, 4 to 5 minutes. Stir in ginger, garlic, tomato, garam masala, turmeric, and cayenne pepper; cook and stir until tomatoes break down and onions are translucent, about 10 minutes. Stir in spinach and fenugreek, cream, paneer cubes, and salt to taste. Cover and cook for 15 minutes, stirring occasionally. You can substitute coconut milk for the cream. This recipe is fantastic. I didn't use any ginger because my wife hates it, and it did take far longer than an hour but well worth it.